Home / Why choose our soap? If you’re looking for totally natural, responsibly made, handcrafted soap; then you’ve come to the right place. We’re experts at what we do, choosing just to specialise in soap. Our attention is never diverted from maintaining and improving our award-winning range, because we don’t make soaps for other companies. We believe our customers deserve proper information about our soap and soap making in general. That’s why we always do our best to explain, in full, even potentially-confusing matters either on our website, the phone, email or in person. We realise that we can’t keep doing what we love unless you also love what we do. Therefore, making great soap, but also providing consistently excellent (and personal) customer service every time we have the pleasure of interacting with soap lovers like you, is also one of our key concerns. We believe washing should be pleasurable, for you, each and every time you do it. That’s why we only make soap that works in harmony with the skin, and why we handmake such a wide variety of soaps. We respect the world around us. Therefore, we chose to make a fully biodegradable, Palm Oil Free product, that is minimally packaged. We also chose to only sell accessories that are plastic-free and sustainable. How do you think we’re getting on? Do let us know if you have any questions/comments or would like to share your ideas about how we can do things even better. -We only use truly natural (not nature-identical) ingredients. -All our formulas have taken years to perfect, and sometimes after 100s of batches of a particular variety, we can still find ways to make little improvements. -Our entire range is vegetarian (mostly vegan) and 100% Palm Oil Free. -Our unique ‘extra cold’ process is even more energy efficient than the traditional ‘cold process’ technique. Heat is used incredibly rarely in making our entire range. -Our soap-making philosophy is based on gently helping ingredients to combine, and letting the soap do its thing naturally. We do not believe in the use of excessive heat, or ‘force-curing’ our bars with the use of dehumidifiers. -Neither our soaps, nor their ingredients, are tested on animals. 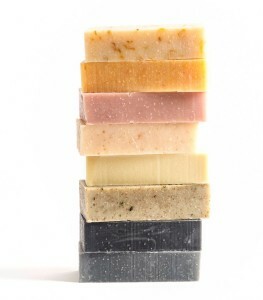 -All our soaps are 100% biodegradable. -Our soap is rich in glycerine, naturally produced during the soap making process. We do not remove this natural moisturiser from our bars. *Don’t eat our soap though! Once the ingredients have been ‘saponified’, or ‘become soap’, they are definitely not edible. **Most soap makers melt all their oils. We believe, however, that you can can create more nutrient-rich soap by minimising your use of heat. Therefore, we only ever melt tiny amounts of our very hard oils, the rest remain in their natural state, at room temperature. ***We might seem crazy, but to ensure that our packing tape really is recyclable, we do not buy it pre-gummed, but instead activate the glue on each strip, by hand, with water.